We can't see any racism around here. Photo credit: DonkeyHotey / WhoWhatWhy (CC BY-SA 2.0) See complete attribution below. For whatever reason (and we have a theory), when it comes to the systematic undermining of democracy and the theft of US elections, we have collectively adopted a series of code words to sugarcoat what is really going on. We are six weeks away from a tightly contested election Republicans stealing another election because they have instituted various laws that make it more difficult for some groups to vote deeply racist laws that keep non-white voters away from the polls as much as possible. Aided by these laws and the donations bribes from US business leaders oligarchs, who want free-market policies no oversight of their businesses so they can pollute the environment and endanger their workers as well as the public with impunity while raking in unprecedented profits and paying no taxes, the losses Republicans will suffer this fall will not be as severe as they should be if only voters decided elections. And the best part for the GOP is that, thanks to landmark moronic and inexplicable Supreme Court decisions like Citizens United and Shelby County v. Holder, this subversion of US democracy is completely legal. One of the great ironies in US politics is that many conservatives who reject “politically correct culture” and like President Donald Trump for “telling it like it is” get really upset when they get called out for their racism. But that is what is happening. “Voter suppression” is just a pretty way of saying that white people, mostly in the South, can’t stomach the idea of being ruled by a government chosen fairly by an electorate that includes non-white people. That point was driven home once again by a report published earlier this month by the United States Commission on Civil Rights (USCCR). There is simply no way to read this meticulously researched 400-page report and come away with a different conclusion. For example, it describes what happened after the Supreme Court decided in Shelby County that jurisdictions with a history of racism should no longer be scrutinized by the Department of Justice before changing election laws. In his decision, Chief Justice John Roberts argued that “our country has changed,” indicating that the preclearance provision of the Voting Rights Act was no longer necessary. That was either incredibly naïve, stupid, or worse. Because, predictably, what should have been anticipated by anybody with half an eye on race relations in the American South happened immediately: It took mere hours before the first states started to implement laws that made it more difficult for … wait for it … people of color to vote. The 400-page USCCR report, which should be required reading for all Americans but which received scant attention in the mainstream media, shows that racism continues to disfigure US elections. Downplaying the truth about this deplorable situation plays into the hands of those who put in place these policies, because people of color and other demographics whose votes are being suppressed would rightfully be on the barricades if they knew what is really happening. In the coming weeks, when you read about new Voter ID requirements having been instituted, you have to realize that these laws do nothing to prevent in-person voter fraud. And they are not meant to. Their real purpose is to make it more difficult for people of color to vote. When you read about polling locations being closed, you have to understand that these are not cost-saving measures. After all, wouldn’t ensuring that all people can easily vote be the last place where you cut spending? Instead, they are meant to make it more difficult for people of color to vote. When you see references to voter-roll purges, you need to recognize that this is not simply an updating of lists to reflect which voters have died or moved. Instead, the goal of these purges is to make it more difficult for people of color to vote. When you hear about changes to voting hours and the elimination of early voting opportunities, then please note that this has nothing to do with staffing concerns or other logistics. Instead, these are just additional ways to make it more difficult for people of color to vote. When you come across a story about felon disenfranchisement policies, then be aware that the only reason these laws exist is to make it more difficult for people of color to vote. Voter suppression is state-sponsored racism. 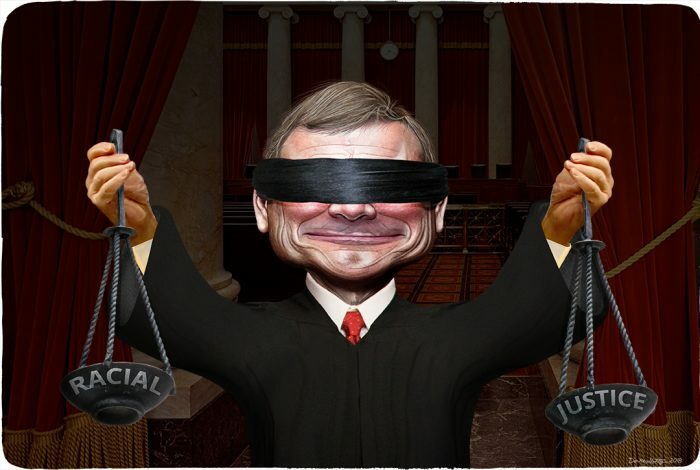 The cartoon above was created by DonkeyHotey for WhoWhatWhy from these images: John Roberts caricature (DonkeyHotey / Flickr – CC BY 2.0), US Supreme Court chamber (Carol M. Highsmith / Library of Congress), and scales of justice (Rae Allen / Flickr – CC BY 2.0).